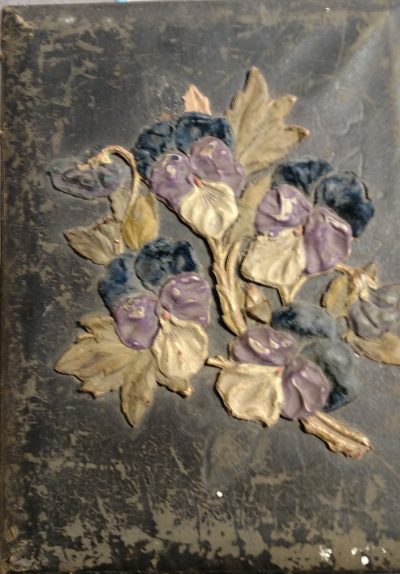 One of the things I received from my grandparent’s house within the last few years is an album full of very old, but unlabeled photos. While on one hand, it’s awesome. The photos are in great condition and there are dozens of them. On the other hand, I have no idea who these people are. Most people I could talk to about it are no longer with us. Fortunately, my grandfather’s older sister, my great aunt Eleanore, is still alive at 94. UPDATE (10/26/16): I did get to visit with my great aunt, though she has no idea who is in any of the photos. So, no luck there. The album is in pretty good shape overall for being very old. 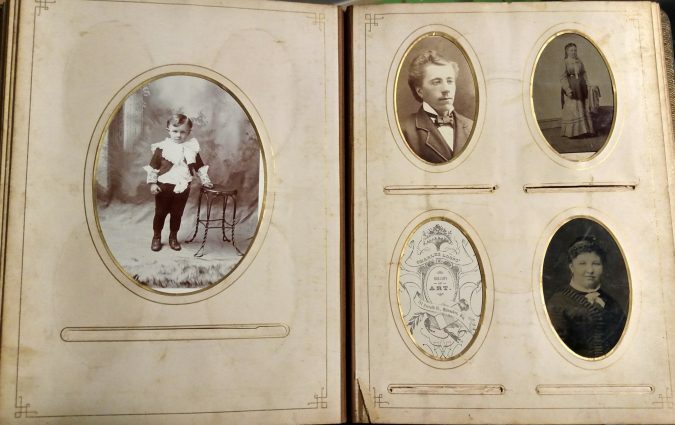 Most of the photos are of the Cabinet Card variety, but there are a few Tintypes included. 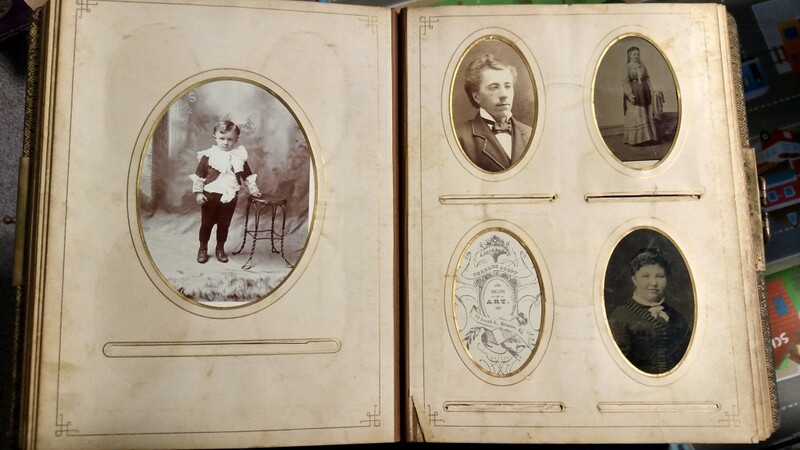 The Cabinet Cards are from photography studios mainly in Milwaukee, Wisconsin, but also from Connecticut and Port Washington in Wisconsin and as far away as Chemnitz and Rostock in Germany. I’ve been able to scan all of the photos, back and front, so I shouldn’t need to keep moving them around. A lot of the pages are pretty fragile and some of the photo holders are ripping and breaking. There are both large and small photos. An example of one of the pages. I”m going to try my best to determine what I can about the photos. I hope to take you on the journey with me as I post my findings here. It may be as simple as visiting my great aunt and her telling me who everyone is (wouldn’t that be nice?) At the very least, I will get each of the photos posted online with as much info as I can. Maybe someone, somewhere will know more about it. 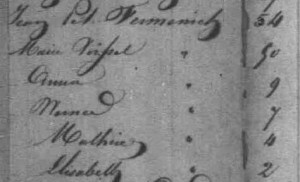 The twenty-fifth ancestor in my 52-week challenge is my wife’s 4th-great-grandfather, Henry LINT. This time I just seemingly picked an ancestor at random. I know very little about Mr. Lint and what I do have in the database may not be 100% correct, but that’s what these posts are for, right? We have the birth of Henry Lint on 11 April 1810 in York, York County, Pennsylvania. According to Wikipedia, this area of Pennsylvania was a big area for the Pennsylvania Dutch immigrants from many areas of Germany, including the Palatinate of the German Rhine. From the little research I did do on Henry Lint, I do remember seeing some Pennsylvania Dutch information. In 1833, Henry married Eleanor “Ellen” Murphey in Holmes County, Ohio. 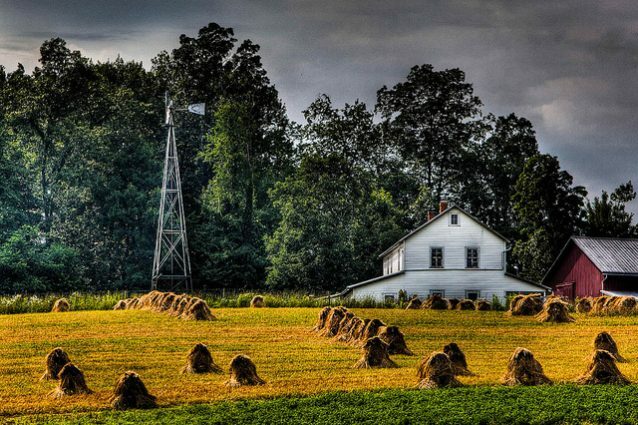 On a related note, Holmes County is home to the largest Amish community in the country and a lot of the Amish descend from Pennsylvania Dutch, which ties Holmes County back to York County. 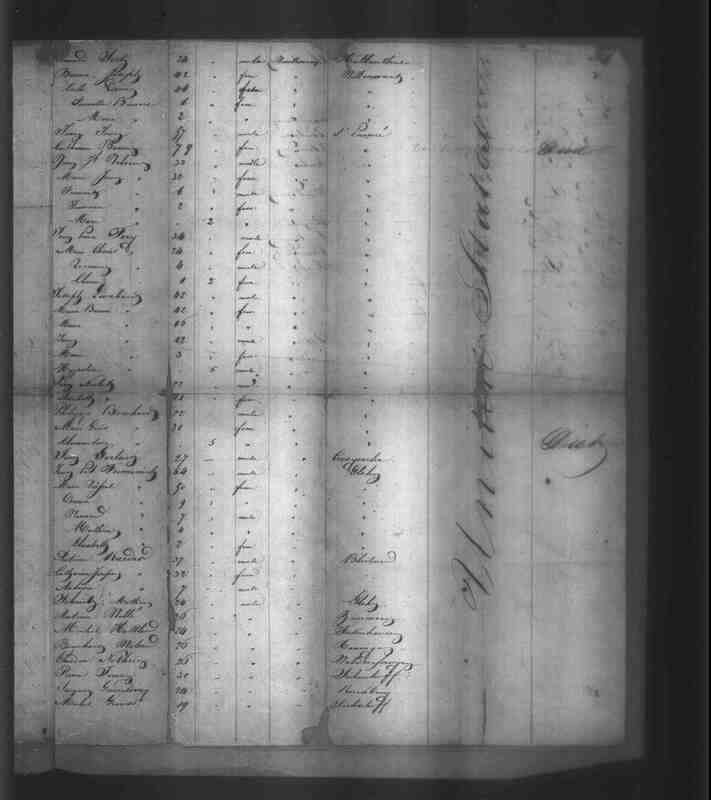 In Ohio in 1842, Henry and Ellen gave birth to my wife’s ancestor, Mary Jane LINT. At some point, the family must have settled in southwestern Wisconsin, as Henry is buried there. Henry died on 7 January 1893 and, just found his entry now, is buried at Bowen Cemetery in Richland Center, Richland County, Wisconsin. This post is 25 of 52 in the “52 Ancestors in 52 Weeks” Challenge” begun by Amy Johnson Crow. It seems I’ve been away for almost two months. Sorry about that. 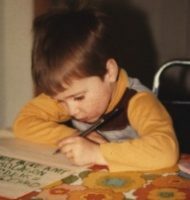 I just haven’t had the time I’d like to do any genealogy research. Though, I’ve been able to do some stuff recently. I ran across more information and was also able to add more generations to my paternal line. Thanks to FamilySearch’s German records, including their Germany Births and Baptisms, 1558-1898, I was able to find ancestors of my great-great grandmother, Barbara Margaretha Magdalena (Maggie) STEARNS. So, I was able to add surnames like KELLER, HEINZ, and BAUER. I was also able to find more information on an unknown line on my wife’s tree. Following her maternal line, I was able to add a surname to her 3rd-great grandmother, Nancy (WHIPPLE) CLEVELAND. From there I’ve been able to trace her via more records and also some WHIPPLE researchers. To prepare for the future, I’ve also merged my “Everything I Know” sites into one place (currently just one for Frank ZALEWSKI and one for Mathias FIRMENICH.) The reason is more technical than anything else, but it will pave the way for easier “Everything I Know” sites. I really enjoy putting those sites together. They not only allow me to do some web work, which I enjoy, but they also require me to go through an individual’s information with a fine-toothed comb. I sometimes find new information or new leads doing this. Plus, it may help someone else in the future. We also have a mini-reunion coming up in the middle of August with some of the CORRIGAN descendants. When I was a kid, we used to go up north to the upper peninsula of Michigan or to Wausau, Wisconsin for a family reuinion for the descendants of Thomas CORRIGAN. They were pretty large. But, now since a lot of the elders are no longer with us, we haven’t done that in many years. So, they put together a small one with mainly descendants of Thomas’ son, and my great-grandfather, Maurice CORRIGAN. Randy Seaver at Genea-Musings came up with this fun post on Saturday. I thought I’d give it a try. Well, that comes to 101%, but it was a pretty random estimate so I’m glad it was even close to 100%. As far as I know, I have no English ancestry. One ancestor is listed as being from Ireland, Scotland and England in multiple census records, so it may be possible. I have a new headstone for today. 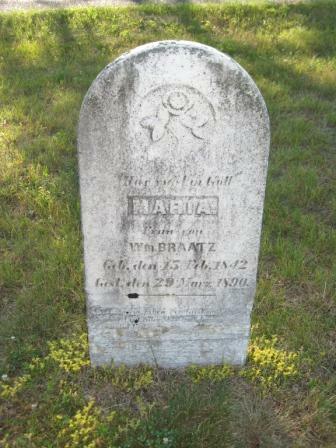 Thanks to Steph F at Find-a-Grave, I now have a photo of the headstone of my 3rd-great-grandmother, Maria BRAATZ. I had run across the info from a transcription of a few cemeteries in Waupaca County, Wisconsin. She is buried at Little Wolf Cemetery in Manawa, Waupaca Co., Wisconsin. In the trascription, she was listed as “Maria frau von Wm” which roughly translates to “Maria, wife of William.” Maria’s husband is Wilhelm BRAATZ. There is no record of his burial, but it is assumed he’s buried nearby even if there is no stone. We’ll be checking into that to make sure. Sorry. Been busy doing other things and due to my short attention span, sometimes I get involved in other things and lose interest in the other stuff quickly. Though, that does mean I come back into genealogy more often and usually with a lot of interest. Here’s is my family history for the week of May 3 – 9. 1905 – Born – Clarice CORRIGAN – Clarice is my great-great aunt on my father’s side. She was born in Sanborn, Ashland Co., Wisconsin where most of the other Corrigan children were born, including my great-grandfather. She passed away in July 1995 in Iron Mountain, Dickinson Co., Michigan. 1849 – Born – Paulina Henrietta (THOMPSON) FIRMENICH – Paulina is my great-great-great grandmother. She was born in Granville, Milwaukee Co. Wisconsin which is part of the Brown Deer area now (not far from where I live.) Her parents were William Henry THOMPSON and Claude-Françoise QUINET. 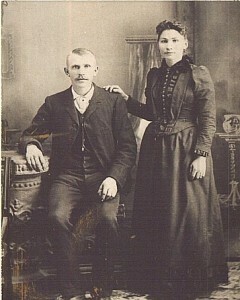 She married Mathis Balthazar FIRMENICH on 11 Feb 1867 (his birthday) in Holland, Brown Co., Wisconsin. She passed away 3 Jun 1910 in Morrison, Brown Co., Wisconsin. She is buried with her husband in Ashland, Ashland Co., Wisconsin where he lived the rest of his life. 1888 – Died – Peter MUHM – Peter is my 3rd-great-grandfather on my mother’s side. He was born 18 May 1848 in Hanover, Germany to Friedrich MUHM and Sophia Elizabeth STRASSMAN. He married Ida SCHAVANDIE on 18 Apr 1870 in Germantown, Washington Co., Wisconsin. He passed away at the young age of 40 in Langlade Co., Wisconsin. 1860 – Died – Mary (CRONIN) MCCANN – Mary is my 4thg-great-grandmother on my father’s side. She was born in 1797 in Ireland, parents unknown. She married Thomas MCCANN, with whom she had 4 children before emigrating to Ontario, Canada.